My husband told me nonchalantly that we would be having cocktail hour and a private tour at Highclere Castle (a.k.a. the film location for Downton Abbey) one night on during our trip to England. He knew that this would be the highlight of the trip for me. To say that I am a fan of Downton Abbey is a huge understatement. I LOVE, love this show and own all of the seasons. So, here's my recap of the evening. We pull up to Highclere Castle and it was seriously right out of the TV show. You could easily have cued the music and the opening credits, because I felt like I was on the TV show. It was surreal. I half expected Carson to open the front door for me. After I took pictures of the outside and fell over in disbelief, I entered the first room, The Saloon, and was overwhelmed with its vaulted ceilings and gorgeousness. It looked exactly like the Downton Abbey. Pinch me. I even pointed out a familiar lamp that is always on the TV show. Even my husband recognized it! There were butlers passing around appetizers and glasses of champagne. My first thought: this is super fancy. I had no idea what to expect. I normally spend the day changing diapers. I immediately convinced my husband to follow me to the library. It was set up exactly like the TV show, except that it had family pictures throughout and certain pieces of furniture were roped off. I wandered around the library (still in shock) and admired all.the.books. Seriously. SO many books and they all looked like valuable antiques. As a book lover, I was in awe. In the corner there were musicians playing various instruments and photographers wandering around taking photos. I'm pretty sure I was the girl in the room with her jaw hanging to the floor. We were able to tour some of the other rooms on the first floor (The Drawing Room, The Saloon, and The Smoking Room) and many of the rooms on the second floor. The staircase in itself is a sight to behold. What was so great about this private tour was the fact you could meander through the hallways and rooms at your own pace. There was no official tour guide, but instead workers placed throughout and you could ask them questions if you had any. It was incredible, especially to see the red room and Sybil's room. The tour continued in the cellar and we were able to check out all the Egyptian artifacts. In case you don't know the 5th Earl of Carnarvon discovered King Tut's tomb with Howard Carter in 1922. I seriously did not expect Highclere to house that many artifacts. It was really atmospheric in the basement and a nice surprise addition to the tour. After a stop at the gift shop (I refrained from buying all the things), we headed back upstairs for more drinks and appetizers. Then in walks Lady Fiona Carnarvon. 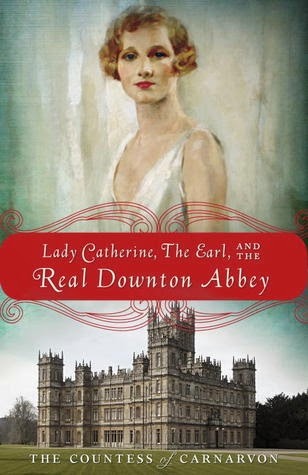 I am not sure many people recognized her, but since I have watched the PBS Downtown Abbey special many times and have read her book, Lady Catherine, the Earl and the Real Downton Abbey, I nearly fell over. She was dressed casually and seemed so approachable. Also, George Herbert, 8th Earl of Carnarvon, entered the room as well and started conversation with his guests. I listened to Lady Carnarvon speak a little bit about things and her favorite sights in London, but once people realized who she was, she had a permanent audience hanging following her every move. I went back into the library, naturally, and saw people were sitting on certain pieces of furniture. I eyed the red sofa. You know, the one that The Countess of Grantham sits on all.the.time. Just as I had hoped, people got up from the red sofa and I made a beeline for it. I sat down and looked around for Lady Mary. But no seriously, it was incredible. My husband walks in and asks me what I am up to. 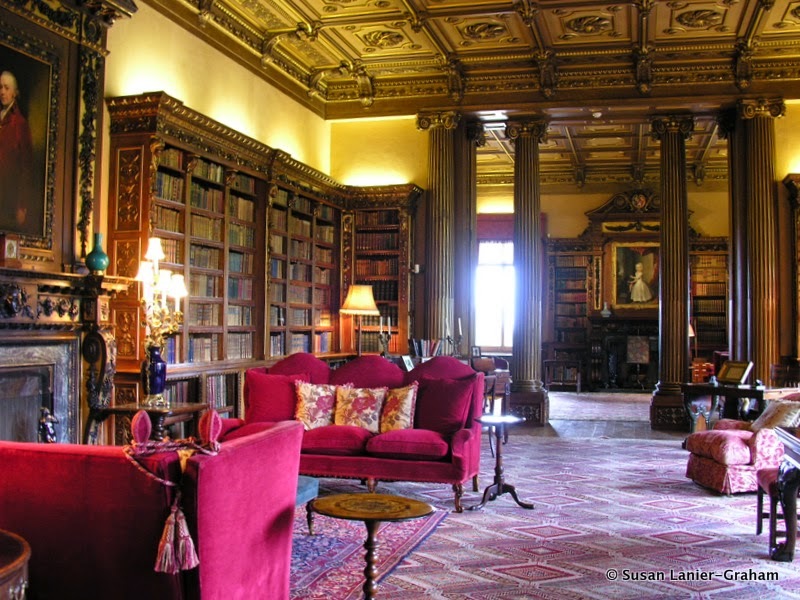 I reply, "Oh, you know….just hanging out in Highclere Castle's library sipping champagne and listening to music. The usual." Umm. No. Never in a million years would I have expected to visit Highclere. It exceeded my expectations. I will be watching season five of Downton Abbey differently this year and that night will go down as one of the most memorable nights of my life, although I am still in shock that it actually happened. Later that night when we got back to our hotel room, there was a copy of Lady Catherine, the Earl and the Real Downton Abbey signed by the author sitting on the bed. I squealed. The perfect ending to the perfect night. So, are you guys Downton Abbey fans? Are you looking forward to season five? If you ever have the chance to tour Highclere Castle, I highly recommend it. Let me know what you think of my night at Highclere. P.S. I would have taken photos of the interior of Highclere, but photography was strictly prohibited unless you were the hired photographer. People didn't necessarily follow this rule, but I am a rule follower by nature and respected the family's wishes. I know, right?! Could you imagine growing up there? I can't wait to see your pics from Ireland and hear about your trip. I went to Ireland a few years ago and absolutely LOVED it. Thanks for visiting, Jenny! I don't watch but shoot this sounds amazing!!!!!!!!!!!!! Juju- I think you'd absolutely LOVE Downton Abbey. You should definitely watch it! Thanks for visiting. I really was a blubbering mess when I visited. Some of the people are our tour had never watched the show, so I looked like a super fan. ha. I highly recommend the tour if you find yourself in the English countryside one day. Thanks for visiting, Jess! Thanks, Christina! It was definitely surreal….I can't wait for season five! Thanks for visiting. What an amazing experience!! I admit, I'm a little jealous. But thank yo so much for sharing with us!! Thanks, Chrissy! It was definitely surreal for me. Thanks for checking out my post! It was definitely a most impressive castle, even if you haven't watched the show before. I can't imagine growing up there! Thanks for visiting, Leanna! We had a great trip! Whaaaaaatt??? This is completely amazing!! I love Downton Abbey too, and this is just incredible! So happy you were able to experience this! !